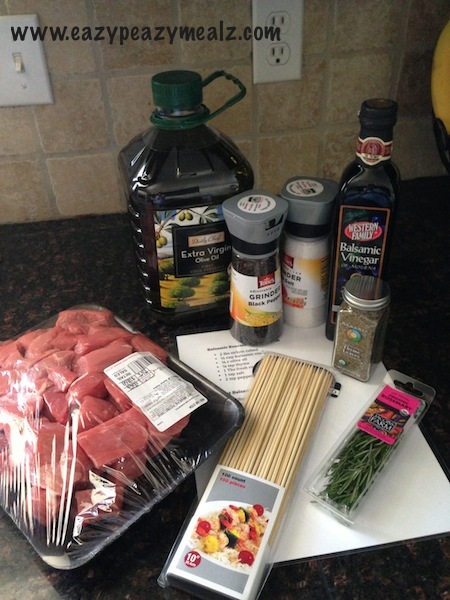 Balsamic Rosemary Beef Kabobs. These flavorful kabobs are tender, delicious, and fun! Sometimes you just need a simple, but flavorful meal. I love how simple these kabobs are. They are easy, they are full of herbs and flavor. And did I mention easy? Mix up your sauce, and add in the rosemary, then add in your chunks of beef, coating them really well. Let them marinade for a bit. Grill or freeze at this point! Place in medium sized bowl with marinade. Grill on pre-heated barbeque, heated to high heat. Cook for 8-10 minutes depending on preferred doneness, flipping half way through.